This past weekend we returned to the trail in New Jersey for our march north! We still have about 24 miles to complete that we skipped, and we will be back to do that either this fall or next spring. Besides that all we have left is the 9 miles to the NY border from Vernon. 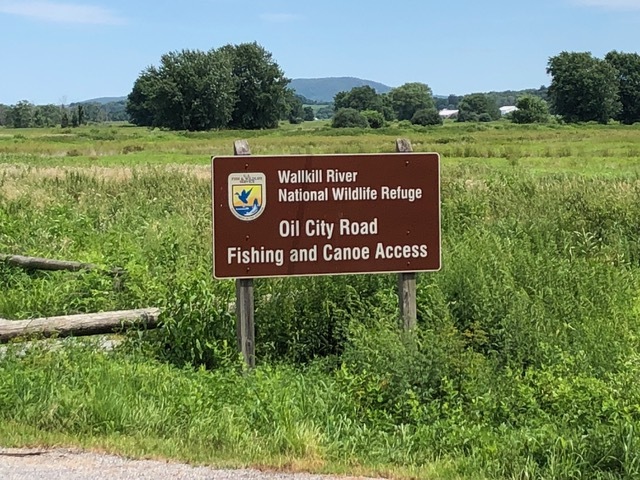 On this trek we continued where we left off with our friends in Unionville, and did all of section 2, finishing in Vernon NJ. We got shuttled by a great guy from the area, formerly involved with the trail conference. He helped build Pochuck (where we spent the night) and Wawayanda shelter. He was also part of the crew who blazed the trail through here, got it off the roads, and helped with the boardwalk projects in the area. We have a good mutual friend in the trail community who recommended him to me. He’s a gem! 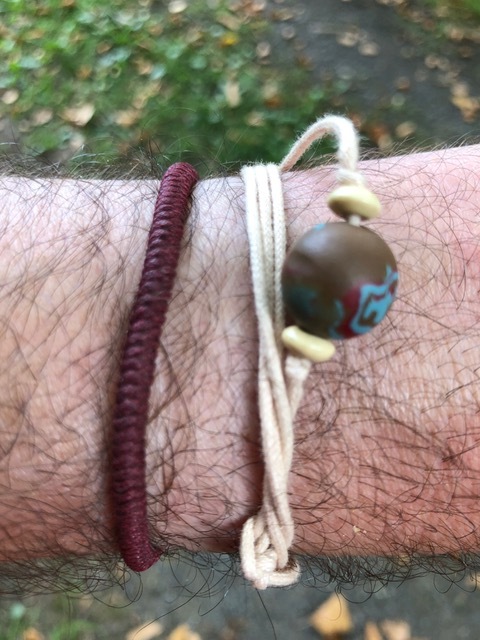 He gave us some nice bead necklaces he made when he picked us up and told us he heard the water source at the bottom of Pochuck mountain was reported to be off as we drove by it on the way to our starting point. Since that was expected to be the case, we stopped by a shop in Unionville and got our water topped off. I also bought an extra bottle as I planned to fill up there and only had brought enough for the first few miles so I didn’t have to carry 6 extra pounds of water. We hit the trail around 1230, planning and expecting to be at the shelter early so we could have our pick of the few tenting areas, and set up our tarp, which we only bring along when we know we have lots of rain on the way. What an understatement! 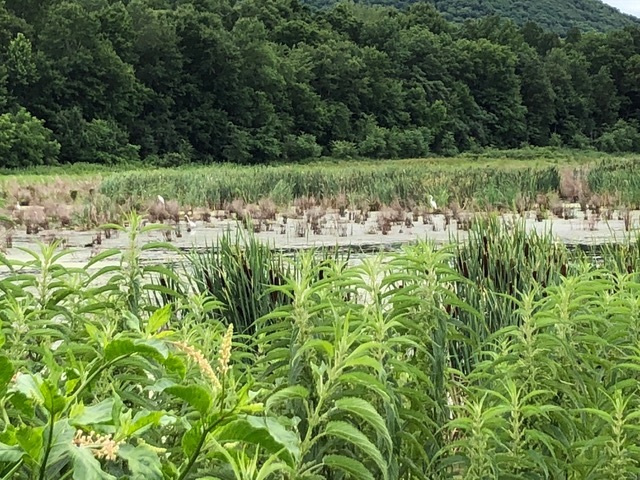 We had a small hill or two before a short roadwalk that would take us to the Wallkill wildlife refuge, the only one of its kind along the whole A.T. Here you do about a 2 mile loop around a giant rectangle that had elements of the everglades to it, for obvious reasons. There’s even a birding platform at the north end. But that was not required. We saw heron, egrets, tanagers, and buzzards. 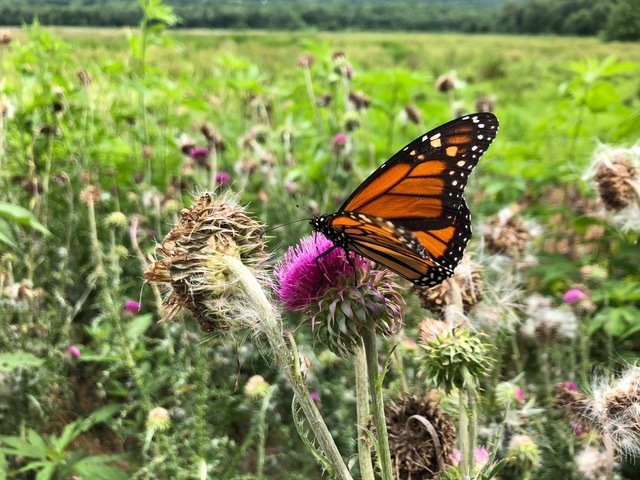 We saw lots and lots of thistle with monarch butterflies and bumblebees practically glued to their blossoms. 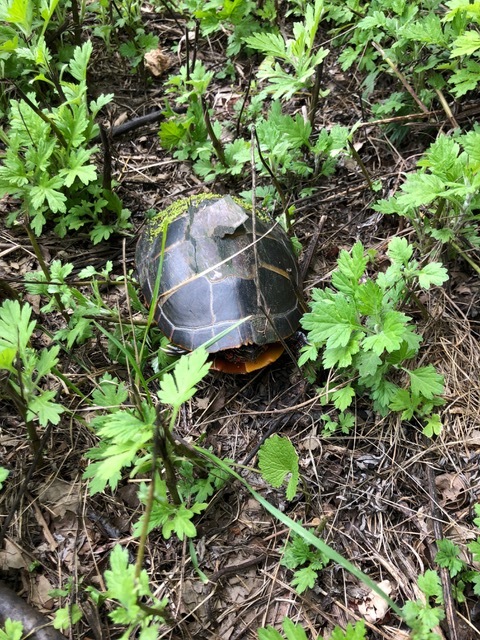 We saw a small turtle, and many types of other wildflowers. It was a lovely walk and there was what we call ‘breeze magic’ to keep us cool, as a large storm was moving in in the next few hours. In full sun and the temps we had last week, that might not have been as enjoyable. We took our time as we had lots of it, and stopped at a few benches along the way to enjoy it before heading up into the woods. 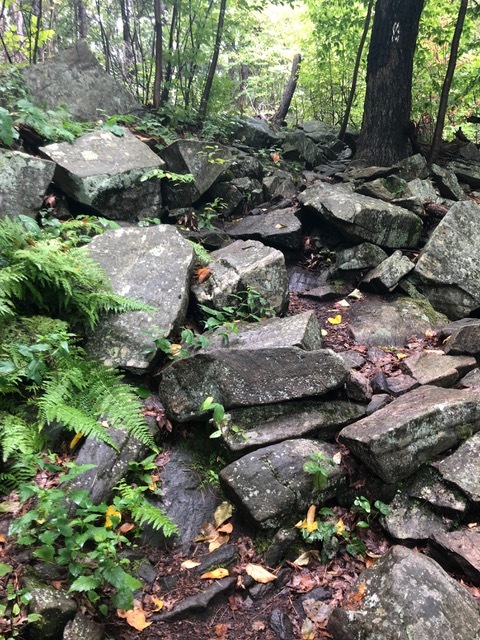 At the last bench we met a thru hiker with her dog toby and mentioned the water source and she said she saw it was just updated in the gut hook app that it was back on. At around the same time George asked us if we could check it on the way up the mountain so he had the most current information. At the next road crossing was the bottom of the climb. And a property down the road with a barn that had a water machine and was selling water for 50 cents a gallon. They have a change machine and a fancy water dispenser and all that. They also have a ton of signs saying they have video surveillance cameras everywhere. While I think this is a really nice service they’re providing given how low water is in the area in the heat of summer, the idea that they would prosecute you if you filled up some water and didn’t have 50 cents is a little over the top and besides there IS a free water source .1 mile up the trail, actually closer in distance to the trail crossing than the barn. Got nice and close, one of my best photos yet! I walked to the barn thinking that was the source but then as we went up the trail the vacant house with the spigot in back was very close and indeed the water was back on. So I question why they have that setup at the barn – is it for when the spigot is off? Or is it for hikers like me who thought that was the water source in the guide? Who knows. Either way its not expensive IF you have some money on you. Also, many trail angels leave jugs of water at trail crossings. Anyway after checking the spigot we did the rest of the quick intense climb up to the shelter. It was another .4 miles of steep to the shelter side trail. But we got there with plenty of time, around 320pm. Hiker midnight, even with a storm rolling in, was at least 8pm. 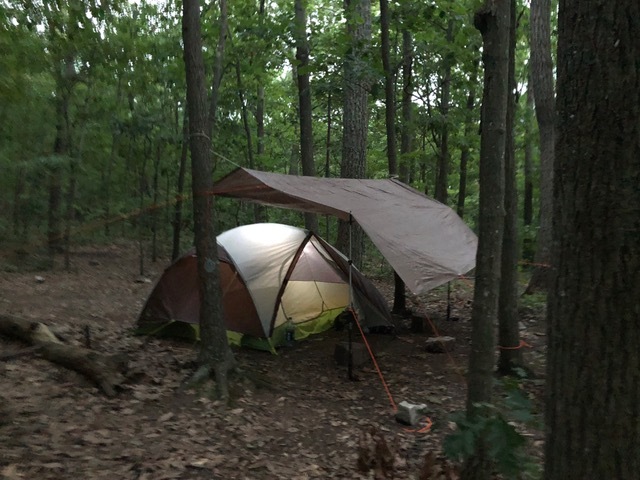 We got our tent and tarp setup and greeted the thru hikers as they came in, including the woman with the dog we met at the edge of the preserve. A few other thrus came in to use the privy and then they continued on to Vernon to stay in town and wait out the rains there. A ridgerunner also came in, and my wife recognized him as the one we met last September at backpackers campsite in DWG. We had a nice time catching up with him after our dinner and a few games of blackjack. Around 8 the storm rolled in as predicted. The winds were high, and the rain came down in flash flood proportions. We had setup on a bit of an uphill so water wouldn’t pool under our tent. But because the wind was so intense, it did manage to blow some water under our tent footprint. But we stayed completely dry through it all, not a drop made it into the tent from above and the footprint helped minimize the water beneath. It stopped around 7 am and the stream of thru hikers at the shelter were on their way. When we mosied out of our tent at 730 to start packing up they were long gone. We had some breakfast, packed up, signed the shelter register and said goodbye to the ridgerunner. Then we continued the climb up and over Pochuck Mountain’s many ridges and shoulders. We went over the main peak and met some guys there who knew our shuttle driver. One said he’s the reason they love hiking. We know he took a lot of kids from the area out on the trail when he was a high school teacher in town. Clearly he inspired many youth. 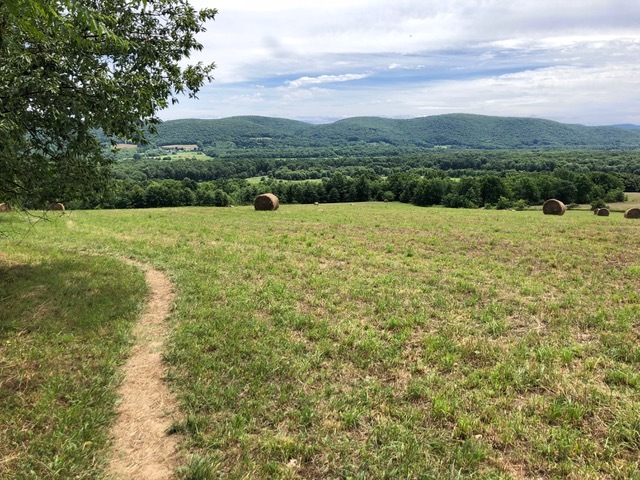 We continued through rocky climbs, boulder fields, forests and along ridges – one with a nice view west to Kittatinny mountain and the preserve and farms below. We crossed a few roads, including one to a girl scout camp that was buzzing with activity. 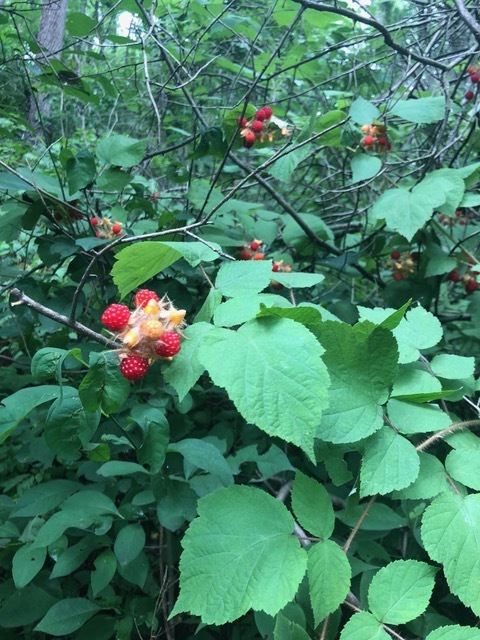 As we came down the steep eastern side of the mountain into Vernon valley, the trail was lined with endless raspberries, which was just the pickup we needed. Many of the houses along here had their own trails here to the A.T. and beyond, clearly to harvest all the berries. We did our best bear impression and indulged in a feast of berries. The trail then reached the beginning of the famous boardwalks. The first was the Pochuck Boardwalk, completed in the 90s I believe. Its almost a full mile of wooden boardwalks over the marshes, with many spots for benches. However there were no benches on this stretch. They’ve had a lot of trouble with parking on the road here and the neighbors association has done much to discourage people parking and starting the walk here vs the other end in Vernon 2 miles east. So we guessed they took the benches off this side to discourage lingering for long periods of time and I assume easing congestion at the parking area near their homes. I have mixed feelings about this. 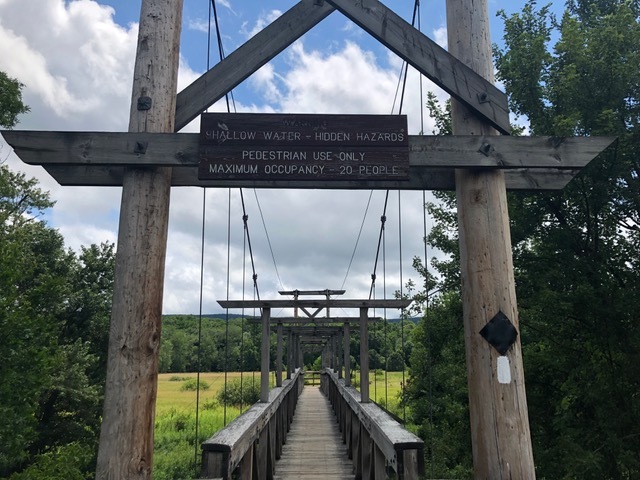 While I understand things were getting out of control at times, this is not only a large tourist attraction built by the town for enjoyment by ALL residents, but also part of a national scenic trail that’s been there for almost 100 years. Perhaps they should have taken that into consideration before moving there. Most people who live by the trail embrace it and provide trail magic and move there on purpose… But I digress… not my battle. 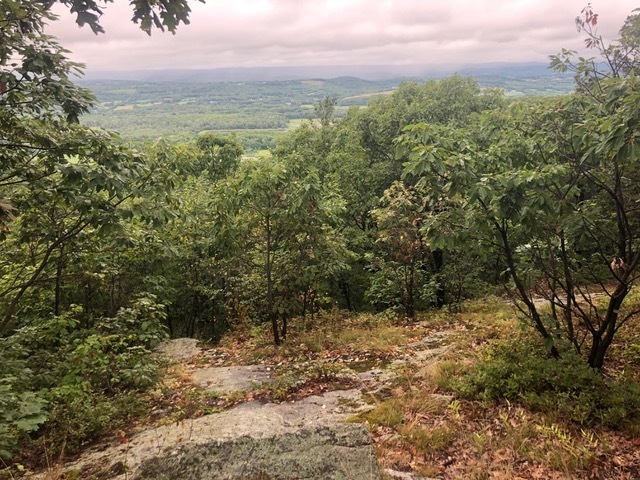 There were nice views of Wawayanda Mountain where the trail continues up to Pinwheel vista and the Stairway to heaven, as well as Mountain Creek ski area further down the ridge. 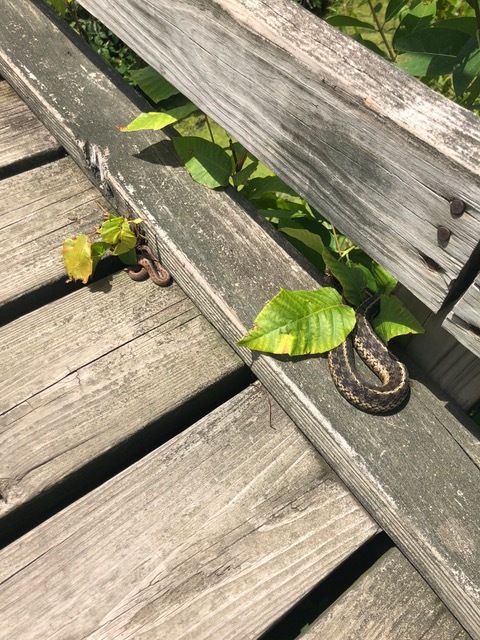 We saw some garter snakes enjoying sunning themselves on the edge of the boardwalk, and found our first bench just before the big footbridge. We sat for a few to talk to someone we met at the trail head the day before but were baking in the sun so continued on. The footbridge sways a bit because its on floating foundations and is a wonder of design. From here the trail wound through woodlands again for a mile which was nice because we got to cool off a bit from the sun. If there’s one place we didn’t want the sun to come back was right when we got to the boardwalk with no shade! This area too reminded us of the everglades, with its boardwalks and wildlife everywhere. 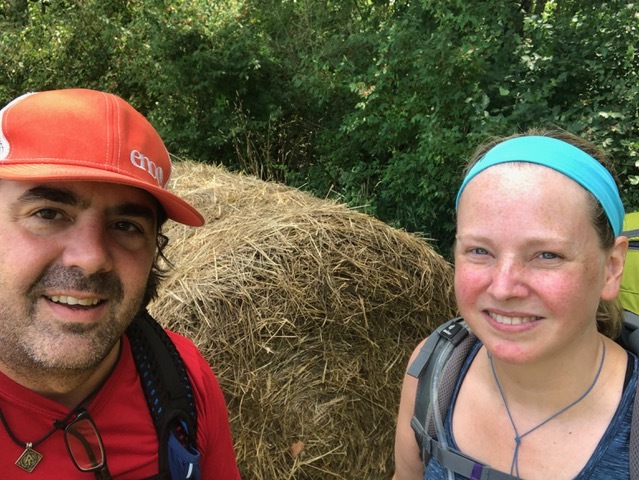 It was a great hike and the only regret I have is that one of our favorite thru hikers we’ve been following online was literally only half a day in front of us, and we would have loved to have met him and bought him his favorite – ice cream! We seem to be missing all the thrus on the trail that we’ve been following, by just hours. Such was the case as well with Scoutmaster in May, but we got a nice thank you card from him when he completed his thru this summer. 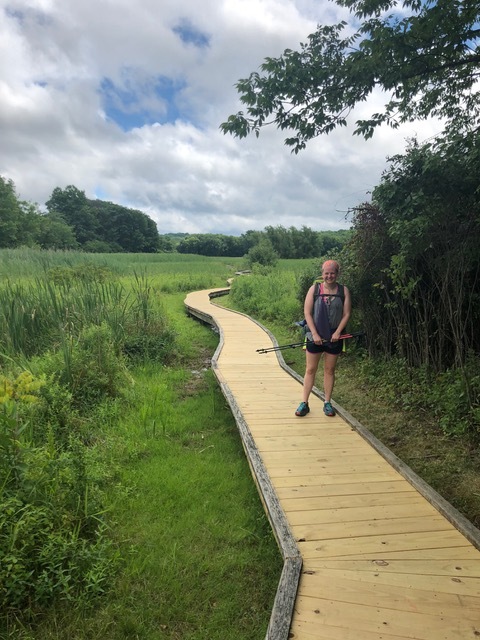 Up next, we’re finishing the last 14 miles of Massachusetts – next month if we can. And I have several ridgerunning weekends to do. See you out there!